Interchangeable lens cameras are called such because, well, you can change lenses. Whether you want to do that, that's an other story - there are people who simply get a 18-300 superzoom and are happy. But I assume that most people want to pick the best lens for the occasion (within their budget anyway). And so, they need to have more than a superzoom. Low light requires particular lenses, and so does portrait or macro photography. Today I will give you a set of 5 very simple questions to ask yourself before you make a purchase. Like with everything else in photography, I had to learn all these things myself, with trial and error. So take my word for it, this works. It will save you money, frustration and stress, and you'll be happy with your purchase. In order to make this easier to read and comprehend, I offer a hypothetical scenario with some hypothetical answers to the questions. Your own needs/answers might vary, but this doesn't matter. Simply ask yourself the questions, and proceed accordingly. b) that you don't try to solve a problem that is user-related. If you think that you need to replace lens X because "it's not sharp enough", there is an overwhelming chance that the problem is not the lens but your technique. So, without further delay, let's proceed. In my hypothetical scenario, I have an entry-level Nikon (e.g. D3300) and the kit Nikkor AFS VR 18-55mm lens. I also have an AFD 50mm f/1.8 lens which doesn't autofocus on my camera. My budget is about $600-700 and I am open to good used or refurbished options. 1. What is the problem I am trying to resolve with the purchase of one or more new lenses? "I need a longer lens, 55mm doesn't feel long enough sometimes. Also, I need a portrait lens that will autofocus on my camera - the AFD 50mm f/1.8 doesn't, and it's not handy to use". Notice how a good answer such as the one above identifies scope (i.e. kind of photography; here, portraiture), or at the very least the specific technical aspect that is missing (here focal length and autofocus capability). Posing such questions and answering them like that will help you understand what it is that you're missing. Your job becomes much easier once you do that - more importantly, you are more likely to purchase based on your objective needs, not because you happened to find a good offer on something. What do I mean by that? Let's say that the hypothetical prospective buyer in this example, while browsing for options, comes across a great deal on a Nikon Nikkor 17-55 f/2.8. Although it's a good deal, it's still an expensive lens - near the top of our hypothetical buyer's budget. Would it help him, though? The answer is no. Although he feels very tempted by this great lens (perhaps optically the best DX midrange zoom), if he looks at the situation objectively he should realize that it will not serve his needs. Basically, it's not too different than the 18-55 he already has - only better optically (especially wide-open) and a bit faster. He also loses VR. 2. Can I resolve all the problems with one lens? "I could, if I could get a long enough portrait lens". The situation begins to clear out a bit. Now it is a matter of narrowing down the technical aspects (then we'll narrow down specific options). Remember, this is only one example with a hypothetical buyer in a hypothetical situation. But although your needs might be different, the questions and the way this plays out will be similar. At the end of this article I will summarize the main "checkpoints" for you. 3. What are the specific technical aspects I need? For our hypothetical prospective buyer, who needs a lens longer than 55mm that can be used as a portrait lens, this is a question of a) focal length; b) maximum aperture (and it should also be fully compatible with his camera, as well as within his budget). "I don't think I need a tele longer than, maybe, 150mm. As for aperture, the larger the better, but realistically f/2.8 is enough". Our hypothetical buyer has identified that he doesn't need a tele longer than 150mm. This is good news, because any longer tele would begin to be problematic for portraiture (see point 4 below, as well as this article). At the same time, the buyer realizes that it should be a lens at least 85mm long - looking for a lens longer than the 18-55 means anything shorter than 85mm becomes a rather meaningless extension. So, we're looking for a lens with a maximum aperture at least f/2.8, and its focal length should be between 85-150mm. Notice the buyer still is not sure whether he needs a prime or a zoom - this will be clarified in the next questions. 4. Are there any drawbacks related to the new lens I should consider? Are there any situations that its specifics will trouble me? What is it that I don't want the new lens to be? "I like how small and light my Nikon D3300 is. I like to travel light, and I have noticed that I take better pictures when I don't need to drag heavy equipment. I would like the new lens to not be too large and heavy". 5. How will the new lens "fit" in my current lineup? Can I picture myself carrying it and using it? "I have the 18-55 and the AFD 50mm f/1.8. Although the 85mm f/1.8 or the 85mm f/1.4 would be fantastic lenses, I think a 105mm prime makes a better pair with my 50mm f/1.8. Especially if I get a body with a focus motor at some point, they'd make an unbeatable combo. But more importantly, I could get either a used Nikkor 105mm f/2.8 VR or a Sigma HSM OS 105mm f/2.8 and have a tele, a portrait, and a macro lens all in one! I can totally imagine myself going around with the 18-55 and the 105mm f/2.8, and be ready for just about anything coming my way. The 85mm would also be great, but probably I would use such a lens in fewer occasions". Notice how nicely the buyer considers future/hypothetical scenarios. They shouldn't be prioritized, of course, but it is important to acknowledge them. Our buyer has reached a decision, and he has narrowed his options down to just one or two lenses. It's then rather easy to make a final decision - it's a matter of price and availability (especially if buying used). As I have mentioned more than once in this article, every buyer is unique and every situation is different. 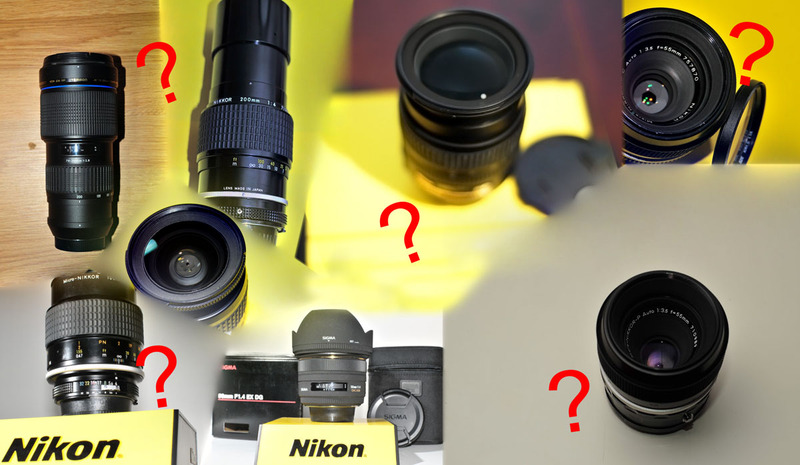 You might have 20 lenses already, or you might have only the kit lens. You might be an enthusiast or semi-pro street photographer, or you might be just a beginner interested in macro photos. It doesn't matter. The questions are designed to help you understand what you need - you provide the answers, not I. To the question "which lens should I get for my Nikon", nobody can answer but you. I see people on forums agonizing over this, asking people to answer for them. It can't work like that. The questions above become progressively more complex (although, in the greater scheme of things, they're still simple), because they lead you towards your goal. Let's see them again in a different shape. Identifying what you want to do with the new lens(es) > See if there is a single lens that can give you everything you require > Be specific: focal length and aperture are the main things, but > Identify whether there are things the new purchase should not have > Identify how the new lens will fit in your current lineup, and make sure you will actually carry and use the new lens. This last phrase might sound silly, but trust me: I've seen too many photographers' shelves filled with expensive but dusty glass on them.